Karen's Kitchen - Home of the most heavenly Coconut Cake and Coconut Cookies in the South. Home of the most heavenly Coconut Cake and Cookies in the South. 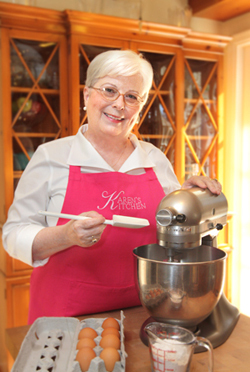 My name is Karen Stanley and I am the owner of Karen's Kitchen. In January of 2009, with an entrepreneurial spirit and the encouragement of family, I began to market a family recipe from my own Kitchen. Developing a very special icing has taken a delicious coconut cake from my holiday table to one of Richmond's favorites! In the Spring of 2012, Karen's Coconut Cake was chosen by Richmond Magazine as one of the city's Top 50 Best Foods to Try Now and was featured on the cover of their May food issue, an honor to add to the many positive and encouraging comments from customers all around Richmond. When people say they "could eat this cake everyday and never get tired of it" or "This is the best thing I have ever, in my whole life, put into my mouth", we feel we have a wonderfully delicious product. Our goal at Karen's Kitchen is to provide our customers with the absolute best quality products at their peak freshness. Making family, friends and neighbors smile with our delightful treats truly makes us happy - honors and recognition from our community are just icing on the cake. Try Karen's Coconut Cake or Karen's Coconut Cookies today and see what all of Richmond is raving about. Enjoy! Karen's Coconut Cake is without a doubt, the best I have ever experienced! It is moist, full of flavor and will surely satisfy anyone's "sweet tooth!" Questions? Please feel free to call (804) 248-4461 or email us at info@ShopKarensKitchen.com. © Copyright 2012 Karen's Kitchen.